Both San Diego State and USD have home games Saturday evening, but the results couldn’t have been more different. The Aztecs collapsed against an energetic Bears team while a clutch play by Isaiah Pineiro gave the Toreros the win over the Antelopes. Brown came out of the gate with more energy and enthusiasm than SDSU and within six minutes, was leading 16-9. The barrage didn’t stop there, the Bears went on a 26-0 run, making six 3-pointers, just before the half for substantial 50-22 lead. The Aztecs didn’t score for more eight minutes. After freshman forward Aguek Arop dropped a trey to pull SDSU to 24-20 at 8:32 before the half, the Aztecs did not score again until Arop’s dunk just before halftime to make it 50-22. The final score was 82-61. Coming into the game, Brown had was 44.8 percentage from the field and 31.4 percent from the 3-point range. Saturday night, the Bears were 71.4 percent from the field in the first name, 53.4 percent for the game, and 62.5 percent from the 3 in the first half and 53.6 percent for the game. 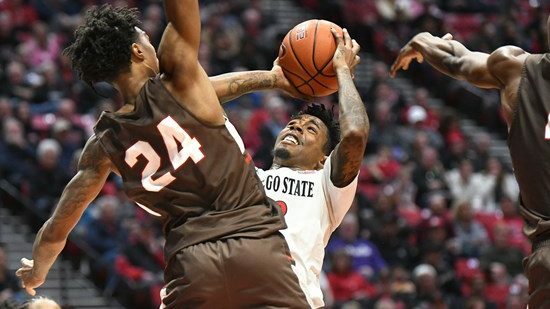 The Aztecs were 35.2 percent from the field for the game and 29.4 from the 3-point range. Meanwhile, over at the Jenny Craig Pavillion, both USD and Grand Canyon were playing defensively, with both team’s shooting percentage below 40 percent until the Toreros broke through in the second half. The Toreros shooting percentage increased to 50 compared to the Antelope’s 42 percent. USD was leading for most of the game with GCU always on its heels with one or two points from tying until GCU’s Alessandro Lever made two free throws with 1:15 left to tie it at 58. Isaiah Pineiro responded back with a 3-pointer with a minute left in the game. After Lever missed a jumper, and USD’s Olin Carter III missed a shot, Pineiro blocked Carlos Johnson’s jumper with two seconds left to win it at 61-58. SDSU will host Cal State Northridge on New Year’s Day for its last non-conference game of the season. USD, meanwhile, starts conference play against the Santa Clara Broncos on Thursday in Santa Clara.